While my family went into Disney Social Media Moms Celebration as pseudo-Disneyland newbies, we were certainly no strangers to Disney. 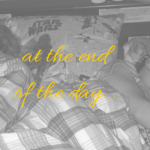 In fact, when we heard that there was going to be a special breakfast hosted by Disney Junior on Saturday morning, we decided the rest of my family would head south to meet me sooner than planned because we knew this was something the kids couldn’t miss. 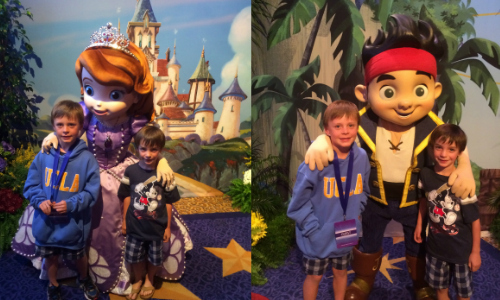 Some of our favorite Disney stories of the moment come to us each day from Disney Junior. Not only does Pink adore Sofia the First, I love the messages from the show, and the CD is a favorite when we’re having sing-a-longs in the car around town (shh, don’t tell the boys I spilled the beans). And Jake and the Neverland Pirates is Little’s cartoon of choice. We’ve also recently rekindled our love of Mickey Mouse Clubhouse thanks to Pink’s enthusiasm for all things mouse. I walked in to the attendee breakfast just as Genevieve of Choo Choo Soul fame was wrapping up. Then, moments later came Reading Rainbow legend and literacy advocate, LeVar Burton. 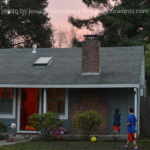 He spoke with gusto and conviction about the importance of moms, books, and helping kids get the tools they need to create their own strong, happy endings. He pointed out that storytelling is as ancient as humans. That we can engage our kids in all kinds of topics — math, history, and science — with truly great stories. 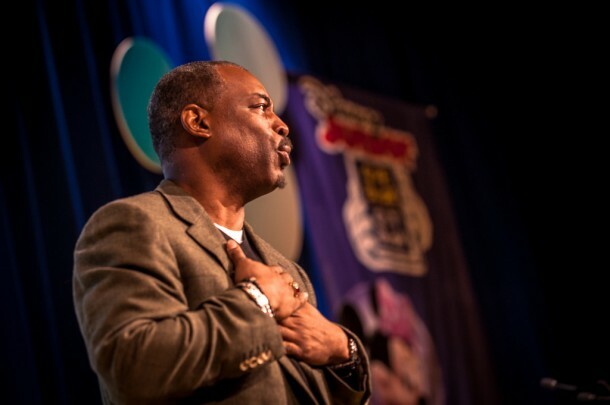 LeVar Burton speaks with passion about storytelling, literacy, and Give a Book, Get a Book. I’m guessing this isn’t news to you as an engaged parent. But this may be… Mr. Burton said that in areas of extreme need, there are communities that have as little as one book for every 300 children. Since I live in a house where books are falling off the shelves thanks to overcrowding, I was in awe of that statistic. And I love that there’s a fun way to help make a difference. 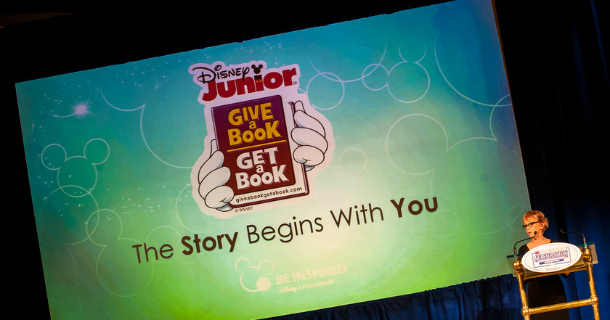 Mr. Burton and friends announced that Disney Junior is partnering with First Book in a new, exciting initiative called Give a Book, Get a Book — and will donate up to one million books to communities in need. Join in the movement to share books with communities in need! The program began in Disney Store locations on April 21st, and will expand to other nationwide retailers later this summer. 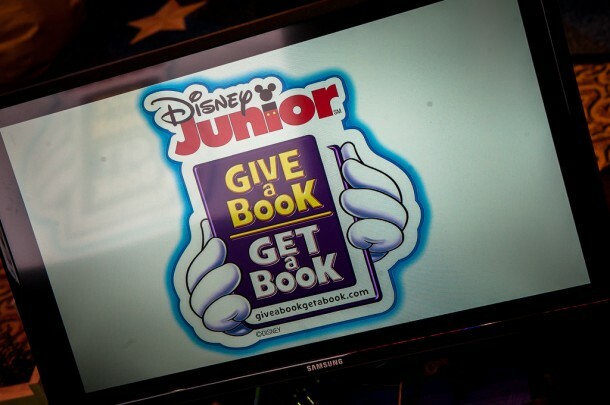 Consumers can purchase specially marked Disney Junior books and products that include a redemption code. (Also keep an eye out for bookmarks with redemption codes at participating libraries and Radio Disney events throughout the summer too.) Each code enables you to GIVE a book to a region of your choosing, and GET a free Disney digital book to enjoy with your family. What a great way to engage kids while teaching them the importance of giving and reading. In order to celebrate the announcement of this great program with our families, we headed back to the main room for story time with Mr. Burton and, it turned out, a few friends. If you look close enough, you can probably see one (or two) of my kids crying. This wasn’t just any story time though. 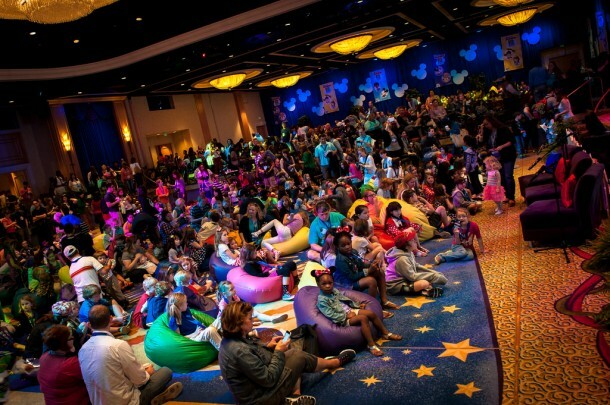 No, this was Disney Junior story time — and our kids were being read to by the voices behind Sofia the First (Ariel Winter, Sofia; Tim Gunn, Baileywick) and Jake and the Neverland Pirates (David Arquette, Scully). While the kids didn’t get the magnitude of the coolness since a couple of them still don’t totally understand the difference between cartoon world and reality, Lenny and I certainly did. Oh, and look in the background of the picture below…One of my favorite things about the entire morning was that it was done in sign language too, so hearing-impaired kids could enjoy the entertainment. 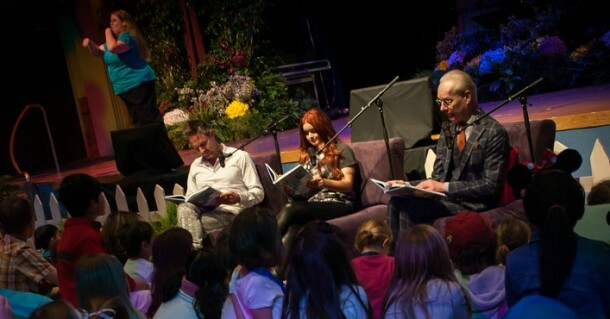 David Arquette, Ariel Winter, and Tim Gunn. There was no mistaking Baileywick’s voice! Oh, and those characters I thought we might meet? We did. And though Pink wouldn’t get in the pictures, she was shouting and waving to her heroes from afar. They may look hesitant, but we were first in line for Jake. Then Little kept trying to sneak up to the front of the Sofia line. All photos not including my children are courtesy of the outrageously talented Josh Hallett (@hyku). Disclosure: I was honored to be invited to the 5th Annual Disney Social Media Moms Celebration held at Disneyland recently. While I paid a fee to attend the conference (as well as my extended stay and travel), it was enhanced with perks to give us an even more magical time. I am not compensated nor required to share my experiences.